Which OS X innovations have been the most significant for the Mac and its users? When Apple took the wraps off Mac OS X a decade ago, it clearly marked a big leap forward from the old Mac operating system. But as Mac users installed that first beta disk, it wasn't exactly clear how big a leap OS X would turn out to be. With ten of updates, innovations, and enhancements under our belt, we can now see how far we've come since Steve Jobs released the Mac OS X Public Beta at the Apple Expo in Paris on September 13, 2000. We now rely on OS X features that early OS adopters probably couldn't even conceive of a decade ago. But which OS X innovations have been the most significant for the Mac and its users? We put our heads together and came up with a list of ten features--for the tenth anniversary of the OS X beta's release--that we consider to be the most significant contributions to the Mac experience. Computing is risky business: All hard drives will fail eventually, and people accidentally delete files. Introduced with OS X 10.5, Time Machine was hugely important for one simple reason: It made backing up your data easy--and therefore, something you were much more likely to do. 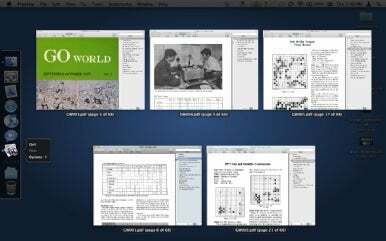 Apple's Preview app is the visible face of Mac OS X's system-level support for the PDF format. Mac users can easily create PDF files with any program that supports the Print command. Because PDF files recreate the layout of the original document, saving files electronically is now as convenient as printing them, except you're free to save, e-mail, or embed them in other documents without losing their unique look. The Classic environment and Boot Camp are very different technologies, but they serve (or, in the case of Classic, served) the same essential purpose--provide the technological safety net and the psychological peace of mind that allowed millions of people to make the switch to Mac OS X. For most "classic" Mac users, the transition from Mac OS 9 to Mac OS X went far more smoothly than even the most optimistic among us expected. But it never would have been so had it not been for the Classic environment, a hardware-abstraction layer that let users run OS 9 applications within Mac OS X, side-by-side with native OS X software. Without the Classic environment, upgrading to Mac OS X would have meant either doing without your favorite software until it was updated for the new OS, or dumping all your existing software and starting over--a prospect only slightly more appealing than simply giving in and switching to Windows. The Classic environment wasn't perfect--some OS 9 apps acted a bit quirky when run within Classic, and a few didn't function at all--but for the most part it worked well and worked invisibly, tiding many a Mac user over until one day, as if by magic, it was no longer needed. Apple's developer tools are probably the top candidate for the title of "most important technology that the majority of Mac users will never touch." Back in the heady days of the classic Mac OS, developers who wanted to write software for the Mac were dependent on integrated development environments (IDEs) such as Metrowerks's CodeWarrior. When OS X rolled around, Apple seemed to have realized that in order for its future platform to thrive, it couldn't afford to have the means for creating great software controlled by someone else. Hence, the introduction of Apple's own developer tools alongside Mac OS X. Included in the package was an IDE--Project Builder--that was a tweaked version of the IDE that came with NeXT, the OS whose acquisition laid much of the foundation for OS X. In 2003, Project Builder became the now familiar Xcode. The Unix underpinnings provided Mac OS X with something long lacking in the Mac OS: stability and performance. Prior versions of the Mac OS lacked protected memory, which meant that when one app crashed, the Mac itself usually crashed. Multitasking performance was also far from stellar, as the OS was written without multitasking in mind. As displays got larger through the years and Mac OS X’s multitasking features became even more robust, the desire to keep more windows and applications running concurrently could often lead to “window-itis”—the condition of getting buried under one’s virtual workspace. When Apple released Mac OS X 10.3 in 2003, it showcased its unique knack for tackling usability problems like this with the introduction of Exposé. Exposé was arguably the first significant attempt by a major OS maker to improve window management since Windows 95 (or perhaps WindowShade in System 8). When Command-Tab and repeatedly hiding or minimizing waves of windows were no longer enough, Exposé offered a refreshing bird’s-eye view of all the applications, or just multiple windows in a single application, that were currently open, as well as the files on your desktop. The feature debuted with just three modes, accessible by keyboard shortcuts and mouse gestures: All Windows, Application Windows, and Show Desktop. For some, Exposé was largely a novelty or a fun trick to show friends why the Mac is cool. For others, Exposé was a window management game changer, a new lease on being productive that helped proved why the Mac is great. Thanks to Bonjour, it’s a lot easier to connect to printers, servers, other computers, and other devices over a network. Originally introduced in 2002 as Rendezvous in Mac OS X 10.2 and renamed Bonjour with the 2005 release of Tiger, Bonjour is Apple’s version of the Zero Configuration Networking (Zeroconf) technology. When devices on a network are using Bonjour, there’s no need to mess with confusing network settings and controls. Bonjour devices automatically make themselves available on the network, and the technology resolves any addressing issues for you. Limiting yourself to just 10 noteworthy features for something as complex as Mac OS X means you’re going to wind up with some noteworthy omissions. We had several features that just missed making our list, including the Dock (and its clever way of keeping the applications you need close at hand) and Automator (which demystified script-writing for most users). We’re also fans of Quick Look, one of OS X’s best time-saving features for getting a glimpse of a file with a simple stroke of the space bar. And we debated including OS X’s support for Intel-built processors as well. But that’s just our list of OS X features worth celebrating on this anniversary. We’re sure we’ve overlooked a couple of your favorites; let us know what’s on your list of OS X’s greatest contributions.